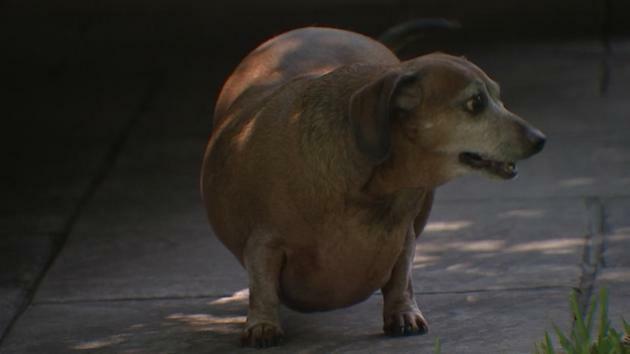 HOUSTON – A dachshund at an area shelter should weigh around 15 pounds, but the dog is coming in at nearly 40 pounds. Melissa Anderson volunteers with K-9 Angels Rescue. She said the owner of 7-year-old Vincent died a few weeks ago and the man’s family did not want the dog anymore, so they turned him over to a local shelter. Since then, Anderson and a friend have been working with the dog day in and day out. 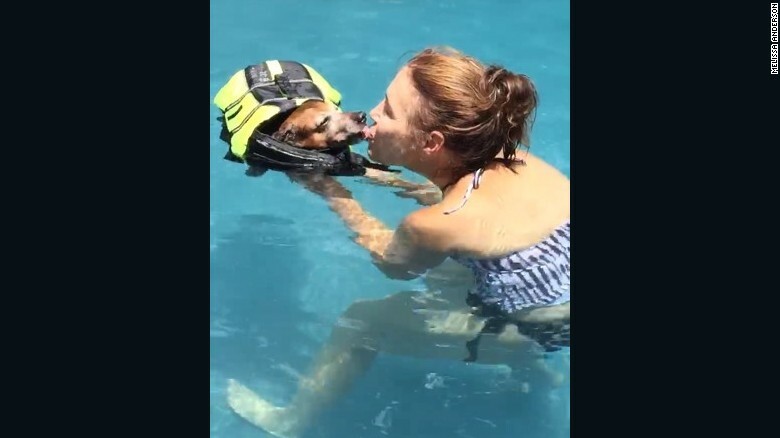 Vincent swims in the pool for 20 minutes a day and has daily walks. He’s lost a few pounds in the past couple of weeks, but he still has a long way to go. Anderson said she thinks the original owner was actually feeding the dog fast food regularly and that’s how the weight was put on. “When I went through Starbucks, when the intercom came on and said, ‘Can I take your order,’ he <Vincent> immediately perked up and he was down on the floorboard of the passenger seat. He jumped up in the seat, which he didn’t do at the time, and came over to the window and his little nose was going crazy,” Anderson said. As the four-legged guy continues on the road to better health, Anderson said she knows it’s going to be a long one. At the current rate, she said it may take five to six months to get to the ideal weight. Obese, unhealthy and mourning the loss of his owner, Vincent was surrendered to a county animal shelter in Houston two weeks ago. His prospects didn’t look good. 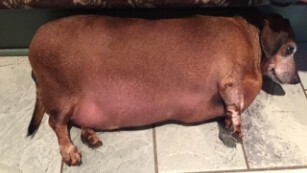 He weighed in at 38 pounds, double the healthy weight for a 7-year-old dachshund. He had high cholesterol and his back dipped from the extra weight, putting him at risk of nerve damage. Mary Tipton, the intake coordinator for K-9 Angels Rescue, and a member of the board of directors for Harris County Animal Shelter, happened to be at the shelter for a meeting when she spotted him. “Vincent was just enormous,” Tipton said. She took a picture and posted it on Facebook to find him a foster parent. 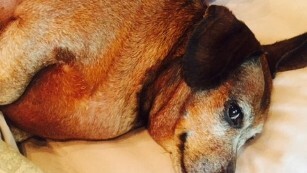 Within 15 minutes, dachshund rescuer Melissa Anderson volunteered to take Vincent in. Vincent’s case is extreme, but obesity affects a lot of pets. In 2014, an estimated 52.7% of U.S. dogs were overweight or obese, according to the National Pet Obesity Awareness Day Survey. Vincent was 38-pounds at the shelter, but two weeks later weighs in at 35.2. Now Anderson is slowly bringing Vincent back to health. The first week wasn’t easy for either Vincent or his foster parent. When leaving the vet with such a large dog, Anderson said she felt fat-shamed by someone walking on the sidewalk. When she took him home, Vincent got sick, both vomiting and upset bowels, when he ate the healthy dog foods she gave him. Anderson could tell he was despondent. “I am not sure what the previous owner fed him, but I think it was all fast food. He was literally detoxing the first week,” she said. But after just two weeks, Anderson said Vincent is well on his way to a healthier lifestyle. Vincent eats a special dog food; Anderson offers him green beans or carrots as “treats” but he hasn’t really gone for those yet. He’s on a pretty rigorous exercise regime, participating in water aerobics five times a week and playing with her others dogs in the yard. The water aerobics help take pressure off Vincent’s strained joints. Plus, with the 100-degree weather in Texas, it offers a nice cool-down for both Vincent and Anderson. At first Vincent just floated at his water aerobics class, but he’s started swimming. At first, Vincent would just float in his life jacket. But his endurance is growing. Vincent can now paddle in the pool for about 15-20 minutes, five days a week. Before, he could only waddle around the yard with the other dogs. Now he is able to jog. “He is really happier now then he was,” said Anderson. She said he keeps a positive attitude and seems to know they are trying to help him. Vincent has gained energy as he’s begun to lose weight. K-9 Angels Rescue is hoping to get him to a healthy weight so he can be ready for adoption, but they aren’t opposed to him being adopted in his current condition. Now, Fat Vincent is on his way to become Skinny Vinnie. He was 38-pounds and two weeks later weighs in at 35.2. His weight loss will be a slow process but with the help of K-9 Angels Rescue he is on his way to his new life. A dog dropped off at the pound following his owner’s death is getting lots of attention for his size. But now, a local group and vets are slowly bringing Vincent back to health. Vincent was dropped off at the pound in Harris County after his owner died. Fearing he would not get adopted Anderson stepped in because she did not want Vincent to be overlooked or worse, be put down because of space. Vincent’s vet has him on a diet and Melissa and her friend Lauren are getting Vincent healthy again through swimming. Vincent enjoys it and is pushing himself. After weight loss, will come walks. Already, Vincent has lost two pounds. Stop giving your dog treats from China that is killing our dogs! Here is a Pumpkin Recipe that is healthy for them. Brown rice flour gives the biscuits crunch and promotes better dog digestion. Many dogs have touchy stomachs or allergies, and do not, like many people, tolerate wheat. Roll dough between 1/4 – 1/2″ – depending on your dog’s chew preferences, and use biscuit or other shape cutter to punch shapes, gathering and re-rolling scraps as you go. Place shapes on cookie sheet, no greasing or paper is necessary. If desired, press fork pattern on biscuits before baking, a quick up-and-down movement with fork, lightly pressing down halfway through dough. Remove from oven and carefully turn biscuits over, then bake additional 20 minutes. Allow to cool completely on rack before feeding. Keep refrigerated, or freeze, for up to 2 weeks as there are no preservatives. A number of pet food brands are contaminated with potentially harmful bacteria and other contaminants that could cause negative health effects to humans and their pets, according to a testing project funded by a group of pet owners and coordinated by the Association for Truth in Pet Food. The project is the first of its kind to use crowdfunding to test pet products. 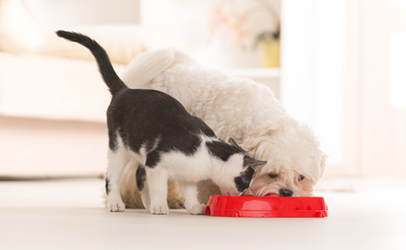 The problems revealed by the project could make a big impact on general awareness of food as a source of illness in pets for both pet owners and veterinarians, one veterinarian told Food Safety News. Pet owners were able to coordinate the fundraising using popular crowdfunding website IndieGoGo. Together, 240 people contributed a total of $15,705 to test pet food brands for a range of harmful contaminants and other problems. The tests found 11 out of 12 pet food varieties contained bacteria considered serious health threats by the U.S. Food and Drug Administration (FDA) such as Staphylococcus and Acinetobacter, including drug-resistant varieties. They also found 3 out of 12 foods exceeded regulatory levels of nutritional content, and 4 out of 8 had medium or high levels of fungal toxins. The pervasiveness of the bacterial contamination alarmed Susan Thixton, co-director of the Association for Truth in Pet Food and author of TruthAboutPetFood.com. Thixton and her colleagues organized the project, with laboratory testing coordinated by food scientist Tsengeg Purevjav, Ph.D.
Data produced by the project help explain the numerous human foodborne illness outbreaks linked to pet food in recent years, Thixton said. Clearly there’s a disconnect between the test results and claims from pet food manufacturers that bacteria are eliminated during production processes, she said. Dr. Cathy Alinovi, a veterinarian in Indiana, reviewed the group’s report prior to release and said the procedures adhered to good scientific standards. Alinovi echoed Thixton, saying that the extensive bacterial contamination was the most alarming aspect of the report. She often sees dogs and cats with gastrointestinal problems and no explanation for their illness other than the food they’re eating. The project tested a number of name-brand dog and cat foods, including Beneful dog kibble and Fancy Feast canned cat food. There was only enough funding to test 8 out of the 12 foods for mycotoxins, which are toxins produced by molds and other fungi that have been shown to cause serious health effects in animals. Two of the eight brands tested above levels considered “high risk” for mycotoxins: Meow Mix Tender Centers and Beneful Original dog kibbles. The Meow Mix product, in particular, was found to have more than three times the high-risk level for mycotoxins. Three cat foods were also found with levels of sulphur exceeding standards set by the National Research Council, but AAFCO does not set regulatory maximums on nutrients in cat food. On a positive note, the tests returned no traces of melamine or euthanizing drugs in any of the 12 samples. Both substances have caused significant pet food scares in the past. Thixton said that she hopes the report shines a light on the need for improvements to pet food manufacturing standards. Alinovi recommended pet owners bring the report to their veterinarian if they suspect food might be causing health problems in their pet. “It’s a great starting point for conversation with your veterinarian,” she said. The full report and other materials are available at the website for the Association for Truth in Pet Food. Cooking – frying, baking, boiling, heating in any manner – severely alters food. High heat kills the food in the sense that valuable enzymes are destroyed, and vitamins, minerals, amino acids, essential fatty acids and various other micronutrients are altered, depleted, or lost completely. Worse yet, heat can initiate chemical reactions, which can turn perfectly wonderful foods into toxins such as carcinogens. The old adage “an apple a day…” is more important now than ever before, since we could literally go a lifetime eating packaged pseudo-foods and never touch upon the health-enhancing nutrition available only through raw foods such as the fresh apples. Fortunately, with increasing awareness and cynicism toward packaged products, many people are feeding themselves and their families more carefully by seeking fresh vegetables, fruits, meats and whole grain products. But what happens to the family pet? Are cats and dogs so physiologically different that they don’t have the same need for freshness? Common sense would tell us that they aren’t different at all. But what about the pet food manufacturers’ strong caution against supplementing their “complete” foods for fear of upsetting the delicate balance of their nutrition-in-a-bag? Nonsense. Fresh and raw foods are as crucial to a pet’s body as they are to ours. Fresh foods should be supplemented to all pets’ diets. Regardless of the boasts, no processed can or bag can possibly provide the total nutrition your pet needs. It is up to you to go beyond packaged foods. Although some foods should not be fed completely raw, there are dozens of enzyme/vitamin/mineral-rich raw foods which will delight your cat or dog. Please see our brochure, How to Apologize To Your Pet for suggestions on easy, raw food supplementation. Moving beyond exclusively feeding processed foods will bring remarkable results you will witness firsthand. Such obvious benefit is the clear marker that you are doing what is right.